I'm installing x3DNA on a Windows OS. I have downloaded Ruby as well as MingW/MSYS systems. Run 'x3dna_setup', and visit http://x3dna.org/ for more info. As shown in the following screenshot, I can reproduce your problem on my Windows 7 system. You are using Windows native command line shell (cmd) instead of the desired MSYS shell. Did you see the 'M' icon (for MSYS) on your desktop? I am trying to install the program, but i am getting this error. The file x3dna_setup exists in the bin folder. I installed Rubby 2.2.5. It appears that Ruby has not been properly installed on your Windows machine, at least the 'ruby' binary is not on your PATH. Could you check to make sure Ruby is directly available as shown in my example? Do you removing my Ruby instillation and reinstalling it again? You could just reinstall and click a button to make sure the Ruby binary available in your PATH at the end of the installation. It should be a straightforward process. I reinstalled another version and still getting the same message. Will you please tell me what do you mean that the binary file should be in my path? How can i add it? I got it to work in my other computer. I got the following image, what is the next step please? Good progress! I was trying to show you this link https://github.com/oneclick/rubyinstaller/wiki/Troubleshooting -- it is here just for the record. Now could you download the 3DNA .tar.gz (tarball) file to your home directory of Msys2, the folder you are in when you simply double-click the Msys2 icon? From your first screenshot, I noticed that you have 3DNA v2.3 installed into your Windows Downloads/ directory. It is more convenient to have 3DNA installed into your home directory. Follow the instructions at URL http://forum.x3dna.org/howtos/how-to-install-3dna-on-linux-and-windows/, and report back how it goes. I proceeded further and stuck in the last step as shown in the attachments. Thx for your help. Or do you suggest redoing the steps that you mentioned in your last reply? It seems that I did the steps that you mentioned before and I got the errors that I posted above. 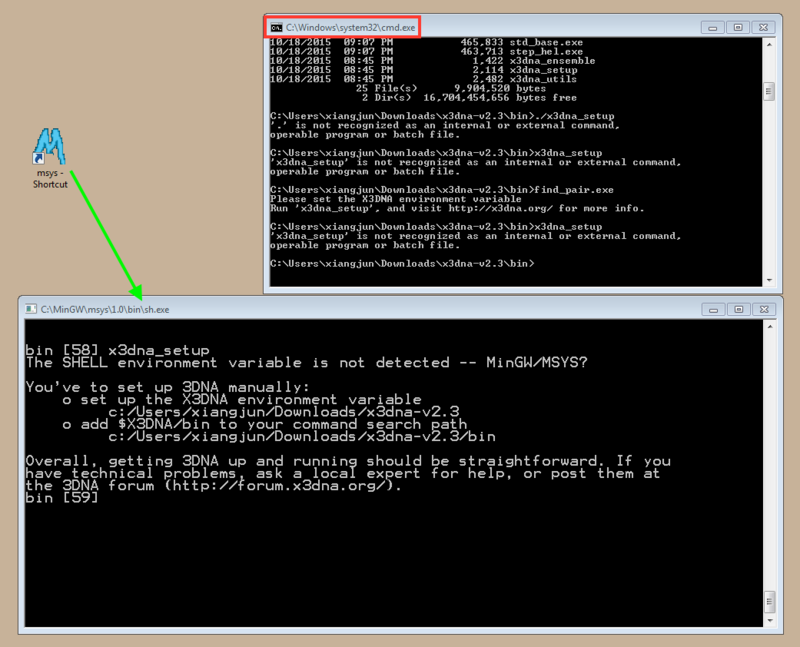 It should report back something like "/home/Ahmed1/dssrC/x3dna-v2.3", i.e., without the C: drive symbol. I got this. It did not recognize the command.